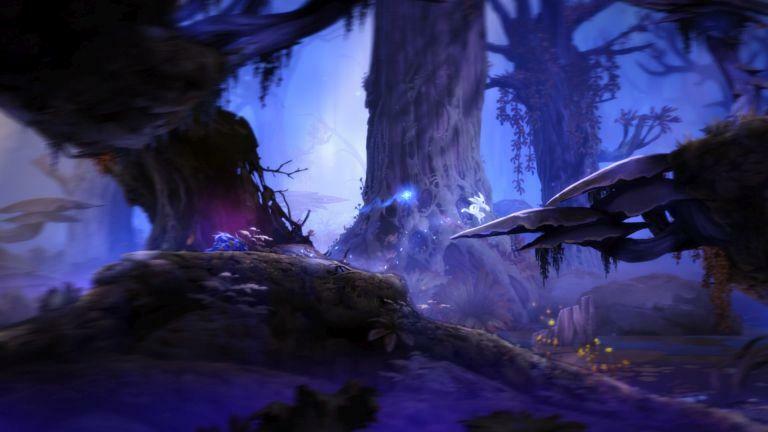 As you play Ori and the Blind Forest, you'll watch your character die. Over and over again. Hundreds of times, maybe. You might even get frustrated, you might say swears at your television. 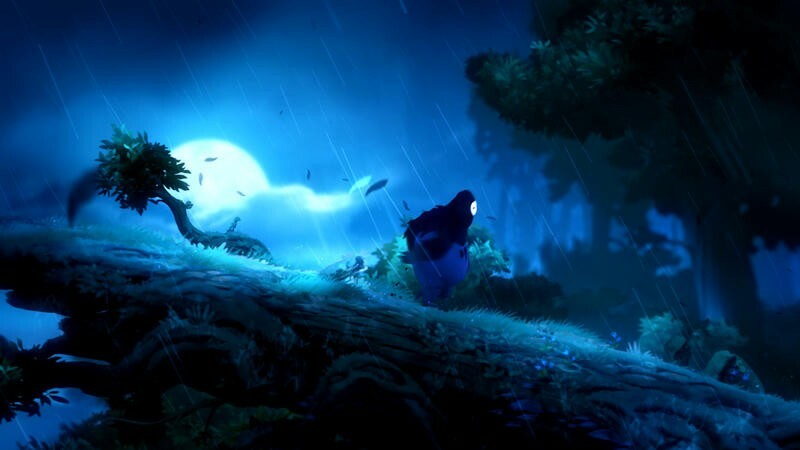 But Ori and the Blind Forest is still worth checking out to experience some of the most beautiful art, smoothest animation, and most polished platforming around. 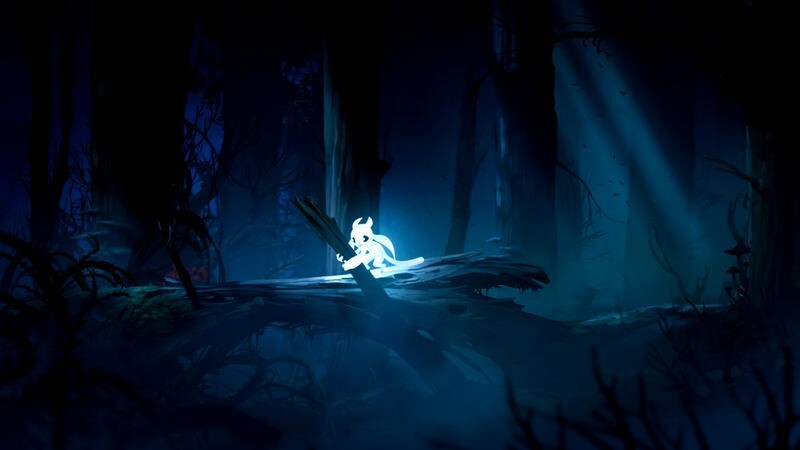 The story here is simple, maybe even hackneyed: something is corrupting the forest, and a few chance encounters put an adorable little animal in charge of saving it all from a dark, malicious evil. 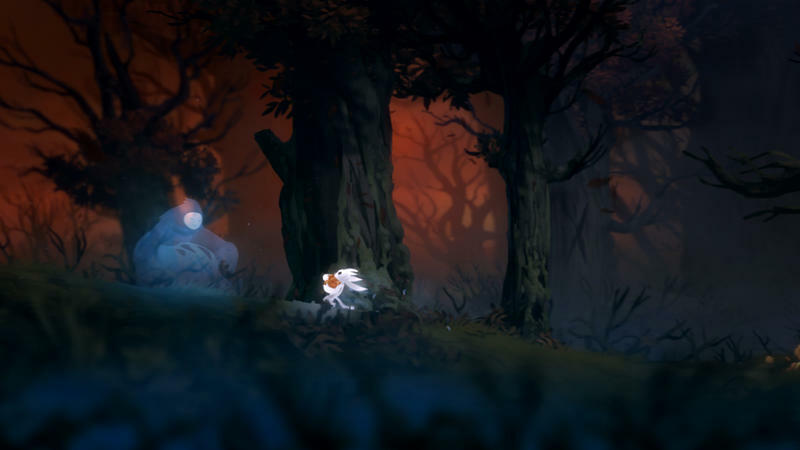 Ori will travel all over the forest, face every kind of danger out there, learn new abilities, and overcome obstacles. But that's okay. Sometimes a simple story works. 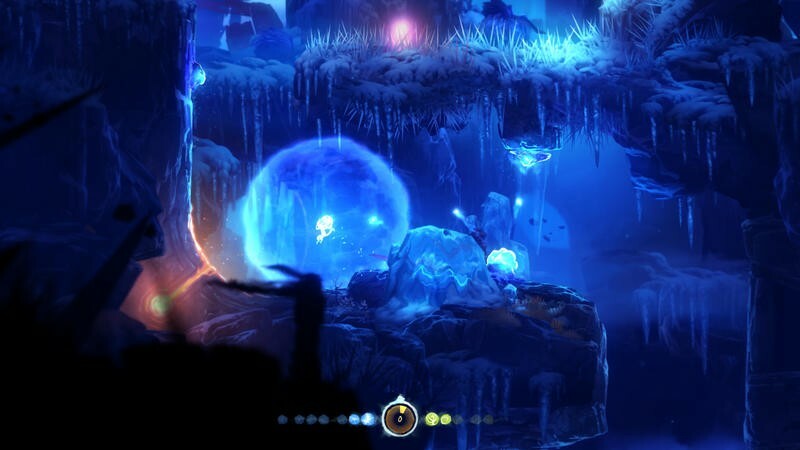 Moon Studios, the developer responsible for Ori, put a few twists on the formula that keeps it from being boring. It starts out with one of the best opening sequences in a while. 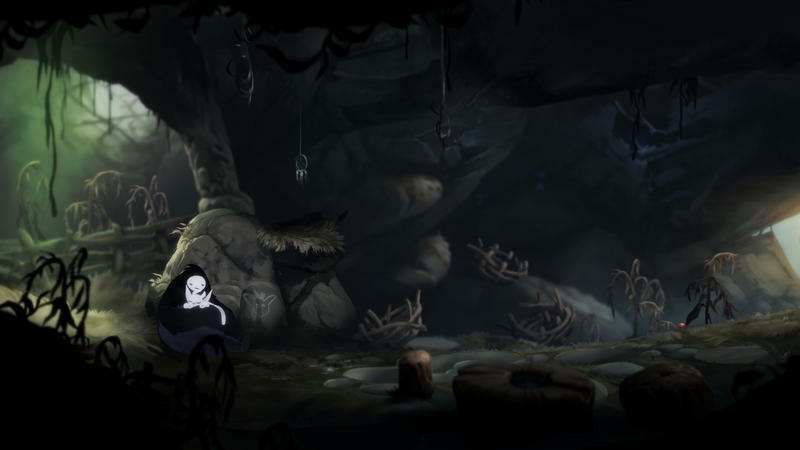 We're introduced to Ori and the being that adopts and cares for Ori through a montage that shows us the happy life the two live together before tearing it apart. The animation shines almost immediately as we watch Ori bringing fruits back to the unconscious creature. 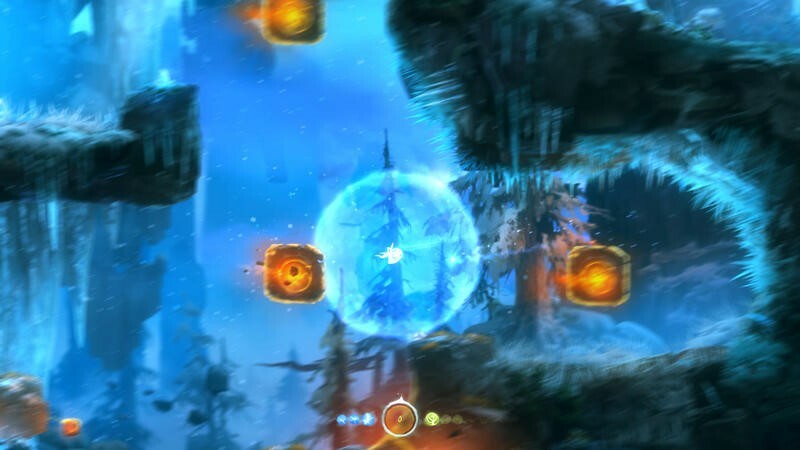 Little touches deliver trepidation, nervousness, and concern from Ori. I was close to cutting onions during the opening sequence. Throughout the story, as well, we get nice touches. The evil isn't simply evil for the sake of itself. 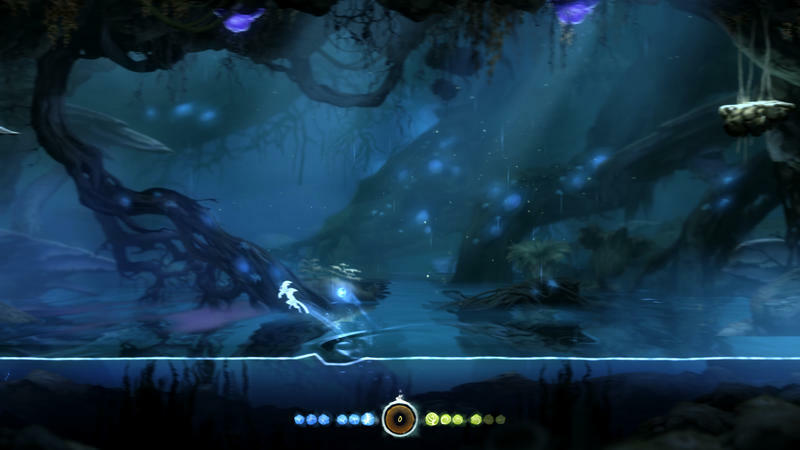 The monster chasing Ori throughout the game has its own motivations, as is usually the case in the real world. Mothers play a prominent role in the story, too. With all the dads in video games lately, this a refreshing shift. The delivery of this is done primarily through animation. There's narration to move the story along; a deep voice in a made-up language adds vague details. 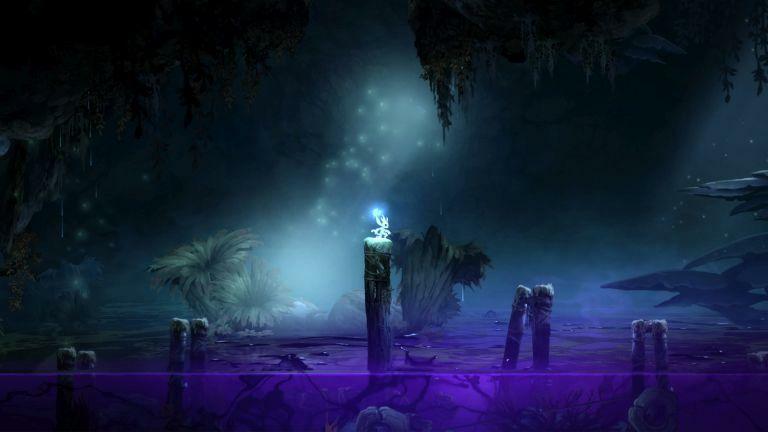 Ori's floating spirit buddy gives crucial instructions and provides some context for why you're putting a glowing shape into a particular spot. Aside from those bits, though, the animation and music do the brunt of the work. It's helpful, then, that the animation is gorgeous across the board, whether it's during platforming or most especially during the game's story sequences. They're short but effective. No movement is wasted, everything we see tells us something about the characters or the world they live in. Things all over the screen are animated. Even the spikes I'm going to bring up later have some movement to them at times. The art itself, too, is absolutely beautiful. Most immediately I was reminded of the darker animation of the 1980s and early 1990s. 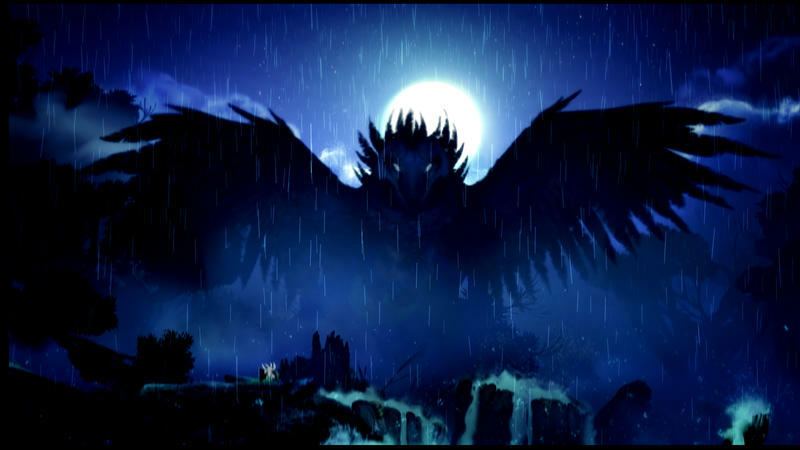 Foreboding forests covered in darkness broken by fiercely angry glowing eyes reminded me vividly of The Secret of NIMH and other Don Bluth stories. Backgrounds are lush and, as the situation calls for it, vibrantly bright or thick with darkness. Even the foreground – stuff in front of the character – is used to great effect a few times. One moment in particular happens early on. 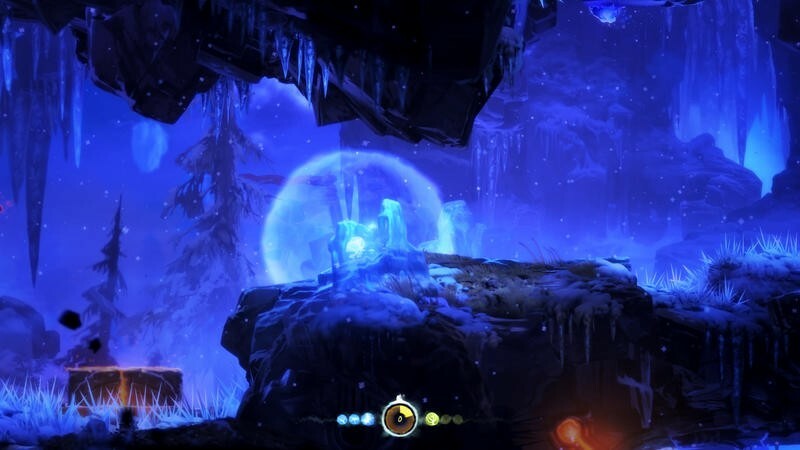 A character we've only met briefly moves around in front of the camera, seeming to watch Ori progress, dipping in and out of frame occasionally. I felt like I was being watched and it was very unnerving. All of this is backed by an orchestral score that is always helping to convey the necessary emotion, always adding to the scene and never taking away. It's not the kind of soundtrack I'm likely to listen to outside of the game, but it fits perfectly to the material it accompanies. 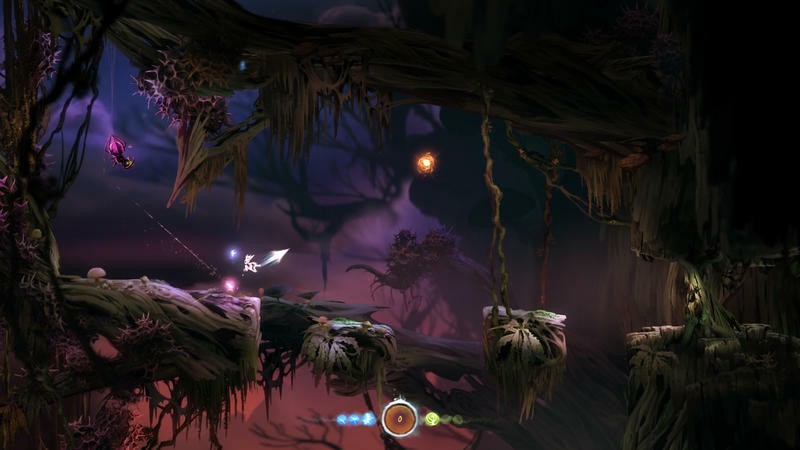 While Ori is saving the forest, though, you'll be saving your game. A lot. 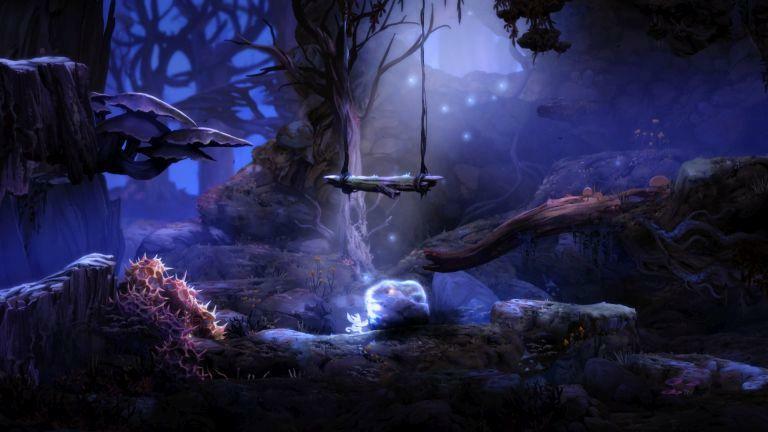 Ori and the Blind Forest's closest relatives are, no doubt, of the Metroidvania variety. 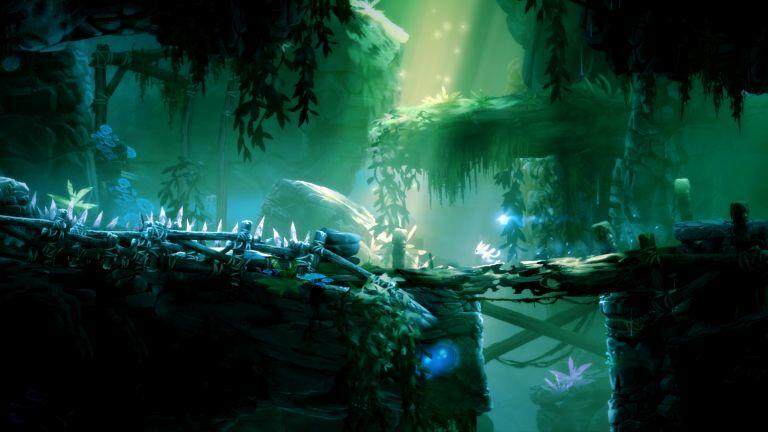 The map is a sprawling web of chambers made of trees, rocks, and spikes. Lots of spikes. The level designers have done their homework. 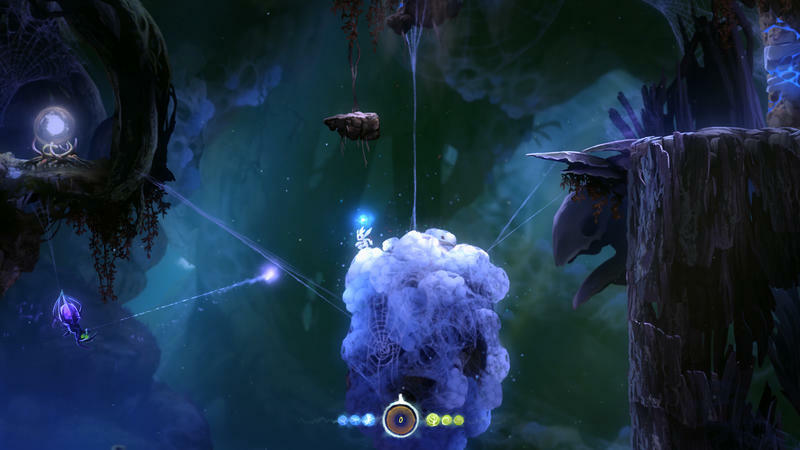 Ori and the Blind Forest is laid out well from top to bottom and end to end. 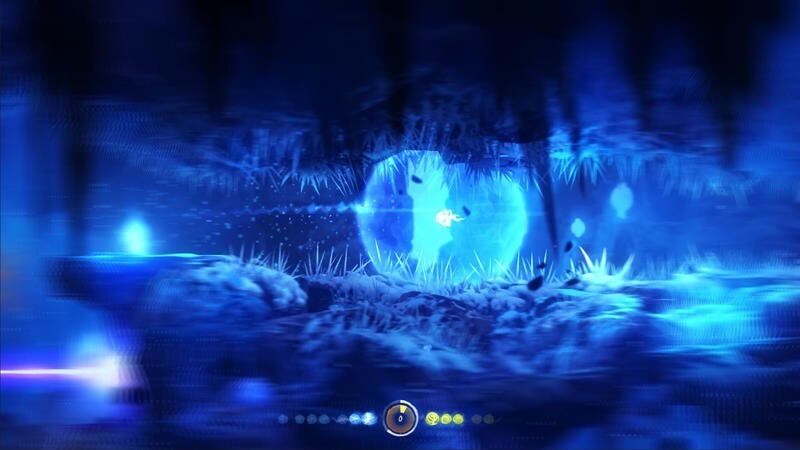 Earlier levels are littered with things you don't know how to or simply can't access. When you pick up a new ability later (like, yes, double jump), you suddenly have a reason to back-track. This is complemented well by one of the better traversal systems I've encountered in a game. The abilities you pick up as you progress through the story aren't so much about new ways to open doors as they are about how to move. My goal with combat by the end was to finish off my enemies without stopping when possible, and it became very achievable. Each addition to the repertoire makes navigation that much smoother. By time you're coming up on the end of the game, that sparkly dot most of the way across the map is appealing rather than off-putting. It's not something you missed, it's something you get to go pick up. With that said, the forest is a deadly place. Did I mention spikes? As you get used to each new tool, you're faced with physical obstacles to overcome, and you will die frequently. The game has a quick save system, but it's a bit different than most games. Usually you either have a save slot or checkpoints. Ori, however, can lay down a save spot just about anywhere there's solid ground. The downside is that these are, with a few story-related exceptions, the only save spots in the game. If you forget to save for 10 minutes and then decide to get a close-up look at an exploding monster's anatomy, you're back 10 minutes no matter what you might've done in the meantime. Once you get used to it, though, it's liberating. Experimenting is – provided you save – all but consequence free. It still takes plenty of skill to get through areas, but it's easy to try a few different ways to see what works best. But that brings me to what is easily the most frustrating, controller-breaking part of the game. There aren't any real bosses. A few tough fights, sure, but no bosses. 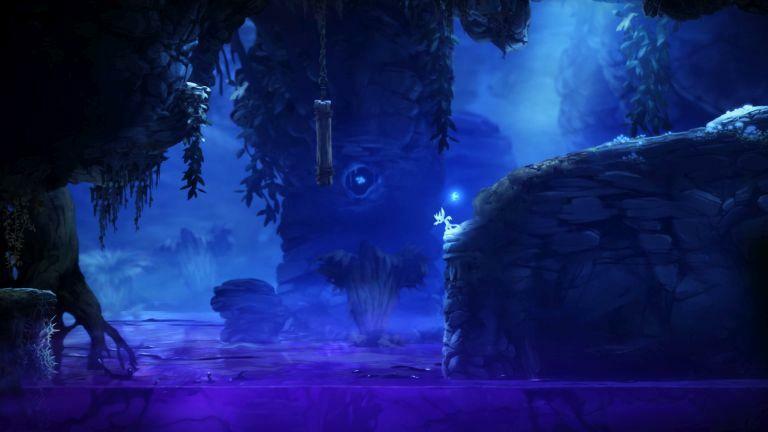 Instead, each of the areas Ori must traverse is capped off with a timed platforming sequence. 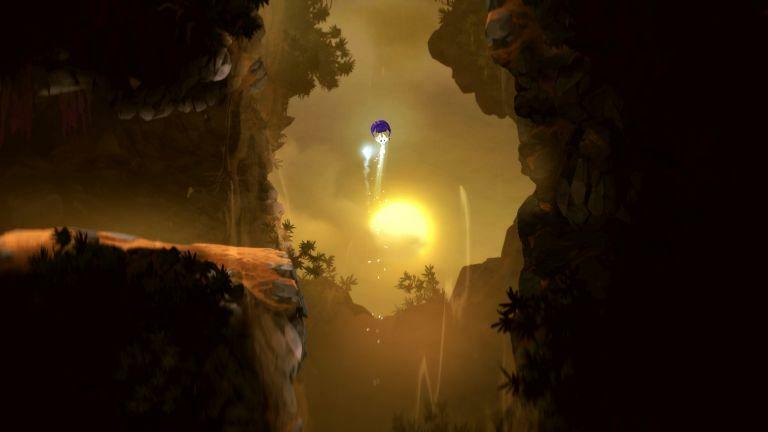 Fans of platformers and explorative games are intimately familiar with these. Lava is rising up, water is flooding in, and escape is imperative. There are several of these sequences throughout the game and the only words to describe the design philosophy that backed these up are "trial and error." It's a bit like climbing a flight of stairs one step at a time and having to start the staircase over after each new step. That liberating save system is gone during these sequences. Death becomes your closest friend. Each new screen presents a different challenge; each simple on its own, but memorization becomes key. The next step often isn't obvious and death comes swiftly. Those first five stairs become mighty familiar as you try to figure out the trick to the sixth. During these sequences, I was sure I hated this game. But the other stuff I liked, I liked so much, that I'll give these a pass. Just be warned that, a few times, frustration lies ahead. 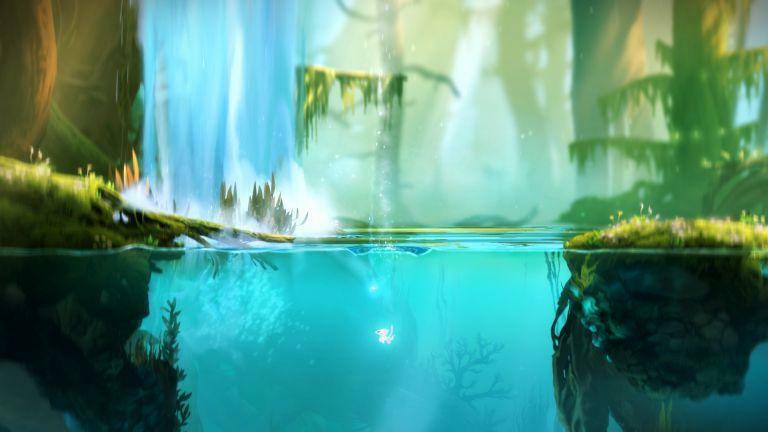 Ori and the Blind Forest is a game built by professionals and it shows. Virtually everything about it has a level of polish not often seen at this price point. 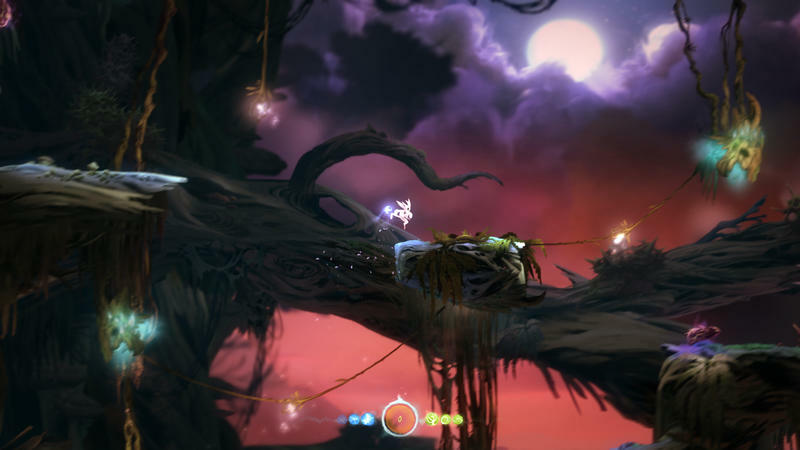 Pixel art has its appeal, but Ori went in the opposite direction and gave us a dense, living world to explore with not just our characters but with our eyes, too. 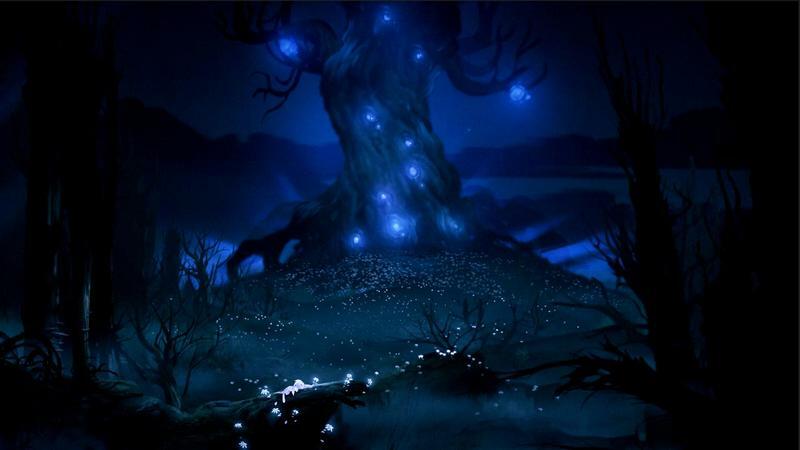 I died 542 times while playing Ori and the Blind Forest. I was frustrated at times, but this is still one of the better games to hit Xbox One (or even next-gen altogether) so far this year. 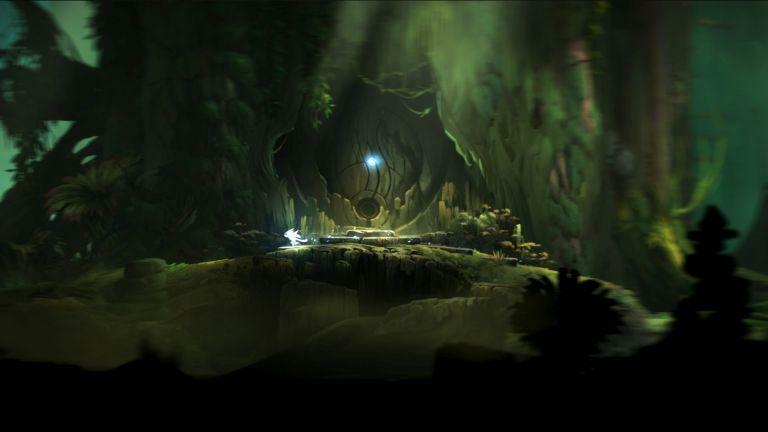 Disclaimer: We received a copy of Ori and the Blind Forest for Xbox One from the publisher. We completed the campaign before writing this review.